A Dinosaur Digimon whose body was corroded by a vicious computer virus. Although it was originally a Tyranomon-species Digimon, it was infected by a vicious computer virus, causing a bug in its flesh's configuration data and transforming it into a frenzied Digimon. Its body turned black, its arms grew sturdier than Tyranomon's, and its offensive power grew. It identifies anything reflected in its eyes as an enemy and starts attacking, becoming completely frenzied. With its Special Move "Fire Blast", a super-powerful jet of flames, it transforms all of its surroundings into a sea of flames. A Dinosaur Digimon whose body was afflicted with a vicious computer virus. Although it was originally a Tyranomon-species Digimon, it was infected by a vicious computer virus, causing a bug in its flesh's configuration data and changing it into a frenzied Digimon. Its body turned black, its arms grew stronger than Tyranomon's, and its offensive power grew. It identifies anything reflected in its eyes as an enemy and starts attacking, becoming completely frenzied. With its Special Move "Fire Blast", a super-powerful flamethrower, it transforms everything around it into a sea of flames. — Digimon Adventure: "The Fairy of Odaiba! Lilimon Blossoms"
A ferocious Digimon infected by a malicious computer. Its Special Move is Fire Blast. 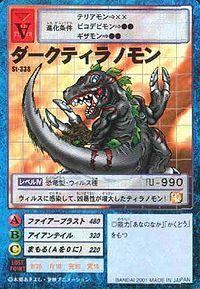 — Digimon Adventure 02: "The Evil Ring's Magic Runs Wild"
| Tyrano is a corruption of Tyrannosaurus rex (「ティラノソーラスレックス」 Tiranosōrasu Rekkusu), one of the biggest carnivorous dinosaurs. 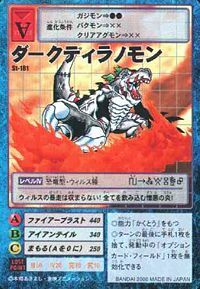 Anime/Manga Digimon Adventure V-Tamer 01: "Folder Continent's Military History"
Fire Blast  ファイアーブラスト Faiā Burasuto Fire Breath/Fire Blast Breathes super-powerful flames, changing its surroundings into a sea of fire. Iron Tail  アイアンテイル Aian Teiru Iron Tail Slams its powerful tail into the foe. While Vamdemon was searching for the eighth Chosen Child, he held a lot of people at a convention center. Mimi was also being held there when Vamdemon let loose a Dark Tyranomon. Mimi had Togemon battle him. Seeing that her digimon was in trouble, Mimi showed a huge amount of purity thus setting off her crest. Togemon evolved into her perfect form of Lilimon and used Hana no Kubikazari on Dark Tyranomon, freeing him from the virus he was infected by and taming him. However, shortly afterwards Vamdemon destroyed Dark Tyranomon. When the Digimon Kaiser attempts to super evolve Agumon into Metal Greymon with an Evil Ring the evolution went corrupt resulting in him evolving into Skull Greymon instead. The Digimon Kaiser called in several Dark Tyranomon to try and take down Skull Greymon but he overpowered them. Dark Tyranomon appeared in Digimon Tamers - Episode 01 fighting Maildramon. After evolving to Metal Tyranomon, it crushed its enemy. 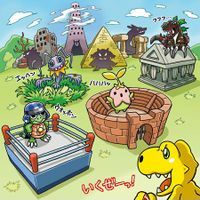 Another one was seen among the many Digimon through the rip in the sky during Vikaralamon's rampage. 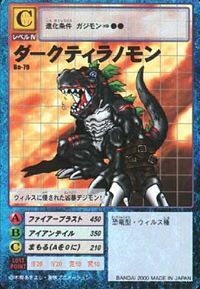 Dark Tyranomon is an obtainable Digimon. Evolves from Betamon (0-2 DP) and can evolve to Ex-Tyranomon (0-5 DP) or Metal Tyranomon (6+ DP). Can be evolved from Agumon Black if above level 16, or can be found at the Training Mountain. He also appears as a boss Digimon at Training Mountain. Can be evolved from Agumon Black if above level 21, attack 100, and Dark EXP 1000, or can be found at Process Factory. Can evolve to Metal Tyranomon if above level 34 and Machine EXP 5500, or Skull Greymon if above level 42, Darkness EXP 7000, and already befriended Skull Greymon. 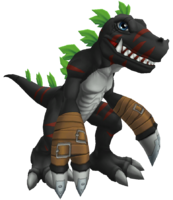 Dark Tyranomon can be evolved from Guilmon, Black Agumon or Dracomon. Can evolve further to Metal Greymon (Virus), Megadramon or Metal Tyranomon. 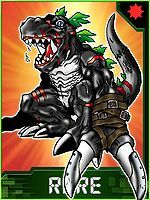 Dark Tyranomon is only obtainable as a collectible card. 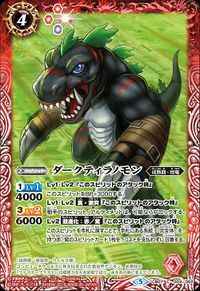 Its card is part of the Tyrano Brothers (ティラノブラザーズ Tirano Burazāzu) set. Dark Tyranomon is available as a Digimon Medal. 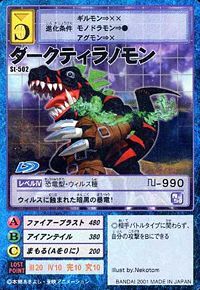 Dark Tyranomon is available as a Digimon Card. Evolves from Gazimon. Can evolve to Metal Tyranomon. 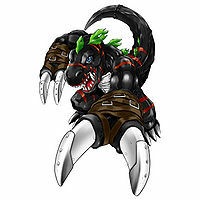 Dark Tyranomon is an enemy Digimon in Area 07. Appears in Area 03 as a wild enemy encounter. 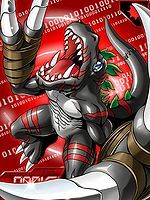 Dark Tyranomon is an enemy Digimon. Can be obtained as a Burst Evolution of Falcomon. It cannot contain the rampant virus! Its flames of hatred engulf everything! Infected by a virus, a Tyranomon which gained even more ferocity! A vicious dark dragon consumed by a virus! A ferocious Digimon invaded by a virus! A Dinosaur Digimon whose body was corroded by a computer virus. With its Special Move "Fire Blast", a super-powerful jet of flames, it transforms all of its surroundings into a sea of flames. ↑ Digimon Tamers: "Guilmon is Born! 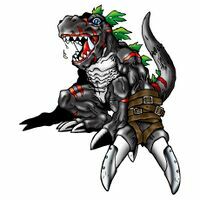 The Digimon that I Created"
This page was last modified on 9 April 2019, at 14:45.